Thirteen years ago Nick Carr published a seminal article in Harvard Business Review arguing that IT doesn’t matter. As the thinking went, enterprise IT spent far too much time and money rebuilding the same applications and infrastructure that was essentially commoditized. The rise of cloud computing and open source seemed to confirm his suspicions, leading many to conclude that outsourcing was the right way to minimize investments in such commodity code. As Redmonk analyst James Governor correctly argued a year ago, “Cloud is of course itself a form of outsourcing, but one that allows for speed of delivery, and encourages reshoring of skills. But people and processes changes are needed to do the work.” Those people who make an ever-bigger impact on an enterprise’s ability to differentiate and compete are developers, and outsourcing them was one of the worst ideas ever conceived. [T]he core functions of IT—data storage, data processing, and data transport—have become available and affordable to all. Their very power and presence have begun to transform them from potentially strategic resources into commodity factors of production. They are becoming costs of doing business that must be paid by all but provide distinction to none. This led enterprises to outsource, with outsourcing dollars climbing year after year. Though the IT outsourcing market may be cooling off in 2016, it still topped a whopping $442 billion in 2015, climbing each year since Carr’s article was written. While he can’t take all the credit (or blame), he helped encourage the belief that hardware and software could be best managed as a cost of doing business, with outsourcing firms well-positioned to lower those costs. Informing this opinion is the resurgent belief that IT matters. A lot. Yes, IT will often be “outsourced” to Amazon or another cloud provider, but this isn’t because enterprises hope to dump the bother of IT on a public cloud vendor. Quite the opposite. Instead, they’re turning to public cloud as a way to make their infrastructure more elastic and more flexible in the face of ever-changing demands. Those that go out and buy expensive infrastructure find that the problem scope and domain shift really quickly. By the time they get around to answering the original question, the business has moved on. You need an environment that is flexible and allows you to quickly respond to changing big data requirements. That’s the hardware. But the people who are figuring out the ideal architecture and applications that feed into AWS, Microsoft Azure, or Google Cloud “hardware” are the most critical components. These are the developers, the “kingmakers” that Redmonk often talks about. They’re the ones driving the growing realization that software is eating the world, and they’re the ones who are gobbling up entire industries with code. Open source code. Code running in the public cloud. So, cancel those outsourcing contracts. Bring software development back in house, and have the people closest to your business choosing the software and hardware they build and run. IT is not a cost, it’s the thing that can separate your enterprise from the pack. Are your Contracts Vulnerable and what to do about it. How vulnerable are your contracts to failure? In the recent series of posts on contract retention, I showed you how to undertake a contract vulnerability analysis. In the post 6 steps to Improving Contract Retention I made reference to the STaRS Model from the book The First 90 Days by Michael Watkins. Using this model can provide you with an effective tool that will allow you to understand how vulnerable your contracts are, and what you need to do as a leader to grow these contracts or to re-energise them. The book was originally written to assist leaders to make successful transitions into new roles. Like all good models, STaRS is a simple concept but deep in meaning and application. This series of posts will set out the situation that you are likely to encounter when reviewing a contract and provide you with a means of understanding what is happening and what action you need to take to remediate the situation. I first read the book at the time that I was moving from one job to another more senior role in another company. I wanted to use the book to help me set out a strategy for the first 90 days to understand the new business I was joining and my role in it. Michael Watkins’ premise in the book is that Executives in transition must gain a quick and deep understanding of their new organisation and adapt to that reality within the first 90 days. Whilst there is a lot more to the book than just the STaRS model it became apparent to me that the model was applicable to Contract management. After all the business of a Service provider is a combination of a number of small businesses that we call contracts. Each contract must be run as a separate and distinct business and as such the premise of the model hold true. The STaRS model lends itself to reviewing each individual contract as a business at different stages of development. No two contracts are the same and no one size fits all approach. So in order to avoid the problem Mark Twain paraphrased “if the only tool in your box is a hammer then every problem will look like a nail”. We need a framework for assessing the contract, which will allow you to tailor your strategy accordingly. It is important to understand that long contracts tend to move along a predictable continuum, rarely are there catastrophic failures, which take a contract from a stable situation to termination. Rather there is a foreseeable transition process through which contracts pass on their way up or down the continuum towards success or failure. It is at those points that your strategy determines the fate of the contract. Using the STaRS model you’ll be able to recognise the clear differences between the different situations and the strategy and skills that are required to bring about positive change. Firstly the model does three things it provides a largely predictable path, which all contracts will travel at some time in their life-cycle. Secondly, the model neatly categorizes the different stages of a contract into 4 clearly distinct phases, all of which have individual characteristics. Thirdly and possibly most importantly the model sets out 3 cycles, which describe the journey between the stages depending on whether you are succeeding or failing. In all situations one wants to bring back the contract to the Sustaining Successplatform for it is only from this stage that the contract can grow. In the contract Start-up phase, the prevailing mood is one of excitement and enthusiasm as well as a degree of confusion. More often than not contracts are started following an accelerated timetable of mobilisation. This is a period of change for all parties, both our staff as well as the Client. The leader’s job is to channel the energy into productive directions and to assemble all the capabilities resources and technology to get the contract off the ground. The challenge is to build and implement the contract including the operating strategy and getting systems up and running from scratch. You will be responsible for recruiting and welding together a high performing team, whilst having only limited time and resources. This will be a period where personalities are sizing up each other and all of this has to be accomplished without affecting the clients business and at the very least maintaining the service standards that were in place prior to your contract. The signature on the contract is still wet and you are still on probation. Failure to adopt and adapt at the Start-up phase will lead to termination before you have had a chance to progress. Whilst you can get bogged down in the changes there are a number of opportunities available to you during this period. You’re in on the ground floor, you’re a fresh broom with the ability to sweep clean. You have the chance to impress and get things right from the beginning. If you have managed to undertake your change management right your new team members will be energized with the possibilities on the contract. You will have a team of transferring employees who are looking forward to the challenge of being at the centre of your companies focus. This is a world of endless possibilities and there should be no rigid preconceptions of what is achievable. In a Turnaround situation, your job is to save a contract from the next step which is termination. It is highly likely that the contract which is widely acknowledged to be in trouble. In an honest appraisal of the events, the group of people on the ground are likely not only to be aware of the situation, but they have known they are in trouble for some time. We may be dealing with a team that has been like a rabbit in the headlights, paralysed, directionless and leaderless. Alternately there may even have been willful neglect, whereby everyone knew what was happening but nobody actually grabbed the bull by the horns and did anything to remediate the situation. In either situation, there were road signs along the way have been ignored and you will be dealing with a group of people who are close to despair. The challenges will be to immediately re-energise a demoralized group of employees and crucial stakeholders. You’ll be called upon to make tough and effective decisions under time pressure. They’re looking for a leader to take charge and provide light at the end of the tunnel. You will need to undertake resource intensive reconstruction work and need to make tough calls early. In situations such as these, it is important that the leader goes deep enough with painful cuts and difficult personnel choices. It is crucial to the ongoing morale of the team that is left behind, that you cut once only and so you need to cut deep. You do not want to be in a situation where six months down the line you have to repeat the process. This leaves the team totally demoralized and not knowing whether those left behind are safe. Whilst this is an unpleasant exercise to have to go through with what is necessary to survive. In the case of willful neglect, it is likely that everyone recognises that change is necessary but nobody has had the courage to execute. In the case where the team is hapless and clueless, your job as the leader is to communicate the need for change. Whilst there will be casualties, if you have done this with empathy everyone will recognise that change is necessary and that those left behind will feel safe and empowered to deliver. As a leader, your job is to ensure that the affected constituencies are offered significant external support. Not only is this the right thing to do it is important for the other team members that are left behind see you that they will not be left to fend for themselves. Where the vulnerability process identifies a contract that requires Realignment, this is akin to a minor procedure as opposed to the major transplant surgery required in a Turnaround situation. As the model indicates, contracts that require the deep and painful process required by a Turnaround situation have almost certainly gone through the Realignment stage without anyone recognising the need for minor corrective action. In a Realignment situation, your focus as the leader should be on re-energising a previously successful initiative that has drifted into trouble and now faces problems. Unlike the Turnaround situation, it is unlikely that the team in place will recognise the signs and so the major obstacle that you will have to meet head on will be to pierce through a veil of denial that is preventing people from confronting the need to realign the contract. The challenge, therefore, will be to convince employees that often deeply engrained cultural and operational norms are no longer contributing to high performance and change is necessary. Do not underestimate this situation. Whilst the size of the behavioural change may be less than a Turnaround situation the challenge will be in getting the team to recognise that change is required however small that may be. This will require careful negotiation and adroit skills at managing egos in being able to refocus the team. The once successful contract will in all likelihood have significant pockets of strength upon which you can build. You are likely to have a client who is a significant ally and still has enough invested in the contract to see it succeed. The support of the client will be a significant rallying point for the people who need to be able to continue to see themselves as being successful. In this situation the contract is humming along, performance is above expectation and you are likely to have significant wins under your belt. Confidence in you and your team is high. This, of course, is a great place to be as the leader. However, you need to be aware that the potential exists to slip into the Realignment stage. The preservation of the vitality of the contract and its relationships is your responsibility and you need to take it to the next level by growing the business. Things are going well but you need to exercise caution, this is not the time to coast. Sustaining Success is the only platform from which you can grow the business. This means that the team will be required to do their day-to-day job in running the contract but in addition, run with up-selling and cross-selling initiatives. Beware, detraction from the day to day issues is a very real danger. Unfortunately, it is a reality that clients will not entertain your advances in terms of additional scope or services if the day-to-day issues are being left unattended or worse still there are service failures. You, therefore, need to play a good defensive role before embarking on too many new initiatives and/or services. As a leader, your challenge will be to find ways to keep your team motivated and combat complacency as well as finding new directions for growth from an organisational and personal capacity. Your previous successes will undoubtedly mean that you have a strong team is likely to be in place. This does not mean necessarily that day will be the right team to instigate new initiatives and supplementing the team with sales personnel for the up-selling and cross-selling initiatives may well be required. The window of opportunity may be fleeting but growing the contract requires a continual balance with the daily operational needs. The foundations are undoubtedly in place that your people will need to be continually motivated to continue the history of success. In your assessment of your contract’s vulnerability, it will fall into one of these categories. If you are in Sustaining Success well done, you have a platform from which to build. I will talk about the Growth Cycle in the next post but beware, this has its dangers too. If you are in Turnaround or Realignment you need to work at getting the contract back to the Sustaining Success platform. I will talk about the different strategies in the Recovery Cycle the Crisis Cycle in the next post as well. Source: workplacefundi.com-Are your Contracts Vulnerable and what to do about it. 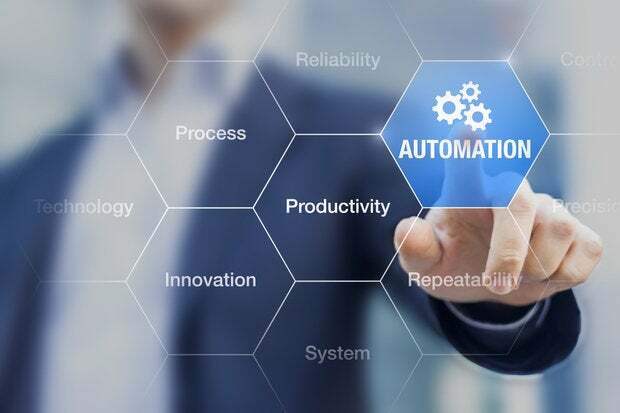 New research analyzes automation’s impact on the IT outsourcing market, revealing double-digit productivity improvements and specific cost reductions between 14 percent and 28 percent. Outsourcing consultancy and research firm Information Services Group (ISG) this week unveiled a new research report to quantify the cost savings and productivity gains from automating IT services. The inaugural Automation Index shows improvements in productivity fueled by automation can more than double the cost savings typically derived from outsourcing IT. Total cost reduction ranged from 26 percent to 66 percent, depending on the service tower, with 14 to 28 percentage points of these savings directly attributable to automation, according to ISG. 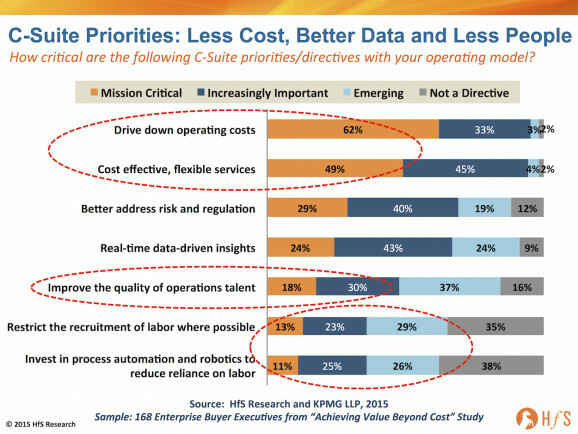 (The typical cost savings from labor arbitrage and process improvements alone range from 20 percent to 30 percent). The report is based on cost and labor data from ISG’s database covering outsourcing agreements with an annual contract value of $10 million or more in which service automation is a core component. The index is one of the first to quantify the impact of automation on IT services. 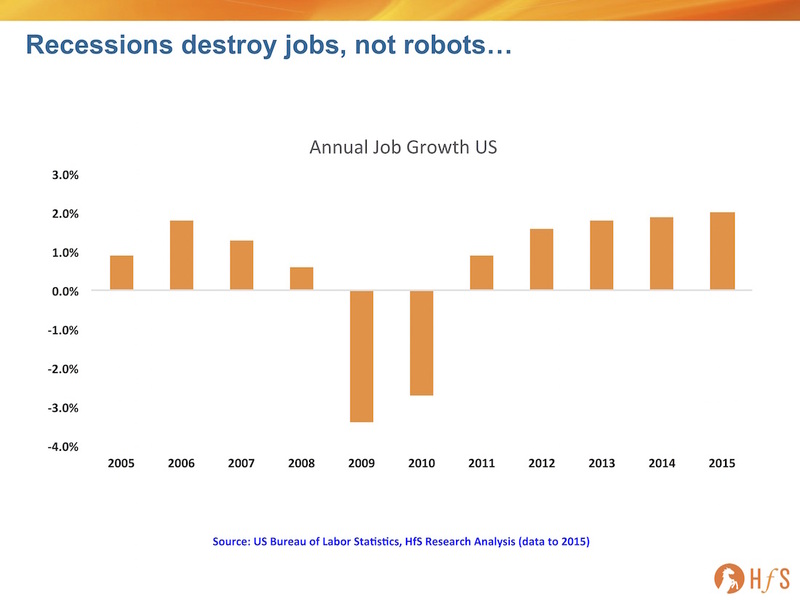 Automation-related technologies and platforms improve the productivity of employees by enabling them to do more with less and prevent problems before they arise, translating into lower costs for buyers by not only reducing the number of provider employees needed to perform the work but also by reducing the amount of work that needs to be performed. The result, says Steve Hall, partner with ISG Digital Services, is a buyer’s market that’s putting tremendous pressure on services providers to deliver more and more savings to stay competitive. “As automation moves up the IT process value chain and into business processes, it will eliminate a significant amount of work through problem avoidance and self-healing, and with it, a significant amount of the headcount needed to deliver large-scale ITO services,” Hall said in a statement accompanying the report. Automation is having the biggest impact on areas in which employees manage physical devices, such as network services. Most IT towers see an average 25 percent decrease in the number of resources required as a result of automation, but certain IT services experience a 50 percent headcount reduction, according to ISG. ISG found that network and voice costs are declining by 66 percent mostly due to the convergence of voice, video and data solutions built on highly standardized and virtualized capabilities, an environment ripe for leveraging automation. Service desk and end user support costs declined by 26 percent due to increased adoption of self help and remote support, the introduction of self-healing functionality, and significant automation of level one and two incidents. Most of today’s automation is focused on computerizing repetitive tasks based on standard operating procedures but more complex automation is beginning to emerge that takes advantage of more advanced data mining and machine learning capabilities, says Stanton Jones, ISG director of research. That higher-order automation can make operational decisions with no human involvement. On-premises ERP is destined for legacy status. How can IT ensure a smooth transition to cloud? Regardless of what you do, you need to improve the bottom line of your business. You need to have your products manufactured in a specific place at a lower cost so that your profits will increase and you will gain a competitive edge that sets you apart from your competition. Not only that, you also need to deliver top quality products that offer a wide variety of features. You need to have great service and have the ability to serve your customers better. It means that you need professional assistance. You need to know how to get started. If you want to achieve huge success, you need to know how to navigate the process of obtaining goods from distant countries, specifically from China. This is why working with an intermediary company becomes incredibly useful. Professionals from China Assured are experts in the procurement process and they have a deep knowledge on local procedures, customs, and everything else that makes an effort to obtain quality, low-cost products in China successful. What follows is a closely guided procedure that ensures quality products eventually reach your customers and you gain significant profit. With China Assured, you no longer need to work hard to find a trusted intermediary. Unless you are well-versed in the customs and culture of China, you will need professionals at the local level to represent you. We have substantial experience and we help you establish relationships. We also negotiate on your behalf. China Assured is your best option because we handle the process from beginning to end. Regardless of whether you are new traders or you are already well-established business owners. We are your most trusted source due to our significant diligence and experience. We save you the time and energy associated with the importation process. Local experts are essential when looking for a trusted manufacturer in China. You need to look for someone with whom you can establish a solid and trustworthy working relationship that lasts for a long duration of time. The best way to find a good manufacturing partner is to follow our proven guideline. As an example, we accompany you to attend Chinese trade shows, one of the biggest of which is the Canton Fair in Guangzhou. At these events, we will connect you with trusted manufacturers that will make any type of product you desire. With this method, you will not run the risk of scams, price gouging, lack of quality assurance, etc. The best way to avoid these pitfalls is to directly choose reliable manufacturers with years of excellent track record. We will not only help you find the right manufacturer in the first place, but also make sure to negotiate the best price deal for you and arrange the fastest production time. And just like with a manufacturer, we will be happy to establish a partner relationship with you. Once you have found a manufacturer through us in China, in some cases, you can’t approach them as you would in the US. There are very strict customs in Chinese culture, especially in the business realm, and it is in your best interest to learn and respect them. China Assured helps you with building these relationships, which are known in Mandarin as guanxi. The complexities of guanxi are deep and difficult to adapt to within a short time frame, which is usually equal to the time you need until a product is ready for distribution. Unless you plan on spending a copious amount of time in China and learn the art of relationship-building within the Chinese society, it’s much better to have a highly experienced partner as an intermediary who understands the local culture, speaks the language fluently, and can guide your business in the best possible direction. China Assured will do this all for you. You are able to meet with every supplier and vendor in the supply chain in our network. You can trust the manufacturer to meet all of your specifications; but you should still need to inspect them yourself. China Assured helps you to consult every supplier and vendor involved and you will avoid a lot of hassles along the way. China Assured monitors the entire process, but it is also up to you to request updates and see that your specifications are met. You need to check up with the manufacturer on a regular basis. Personally visit the factory, or have China Assured do it for you. When visiting a Chinese manufacturer, you may speak with management and the workers. Auditing a manufacturer is crucial to ensuring that your product is produced at the highest quality and under the best practices. China Assured is a premiere intermediary that ensures manufacturer’s legitimacy is validated and oversees them every step of the way. Arrange for the best method of shipping, based on what you plan to ship. Choose air or sea transport and arrange for a logistics provider to take care of the details. Make sure you’re adhering to all customs and quality procedures. China Assured handles all of this for you: we make sure manufacturers conduct proper internal inspections, provide proper labeling, and deliver products from the overseas factory to your doorstep. And that’s it—the ultimate guide to outsourcing in China get you started on your importing business with trusted manufacturers in China. 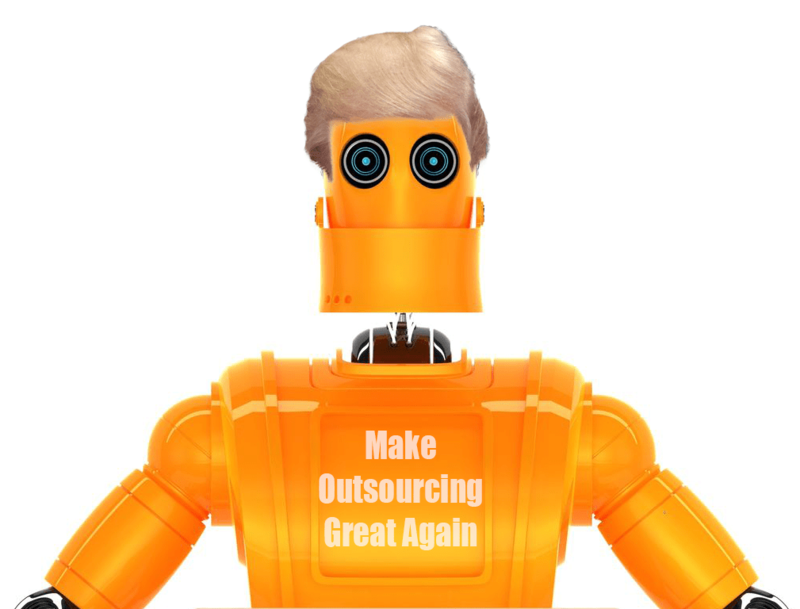 Let’s make Outsourcing Great Again! The State of Denial is over in the States. In White Plains for the HfS Cognition Buyers’ Summit, the mood was the most upbeat I have experienced in a long time – clients were peeping above the bed covers and saying “I want real examples, I want to touch and feel this automation stuff… tell me what I need to know and how this is done”. There as a stark admission that “our kids will be alright, they live and breathe what is needed in organizations today, its us mid-career folks who need to be worried – we’re the ones who need to reinvest ourselves if we are to stay relevant”. BPO and IT services provide the modern business with the ability, not only to survive and thrive in today’s disruptive market, but it’s here for today – not just tomorrow. BPO is not some legacy service that’s going the way of the robot, it’s a very real solution that is more imperative than ever for the survival of our most advanced digitally-savvy businesses. I recall one of our analysts recently coming back from a visit to AirBnb’s new BPO contact center and she was actually shocked – “Phil, it’s just your classic BPO center providing traditional customer support services.” Digital businesses actually need BPO to function – why do they want to going out and hire armies of support staff and processing people when they need to attack their markets at warp speed? In many industries today, digital business models can completely take established legacy enterprises out overnight. If you are an insurance firm with 10,000+ people processing claims onshore using green screen computers, or a bank which still has hundreds of branches employing tellers from the 1970s, or a retail outlet with no mobile app strategy, you are at dire risk of competition coming at you with a completely mobile app-driven, user friendly, intuitive and cognitive business model, supported by intelligent, affordable BPO and IT operations. 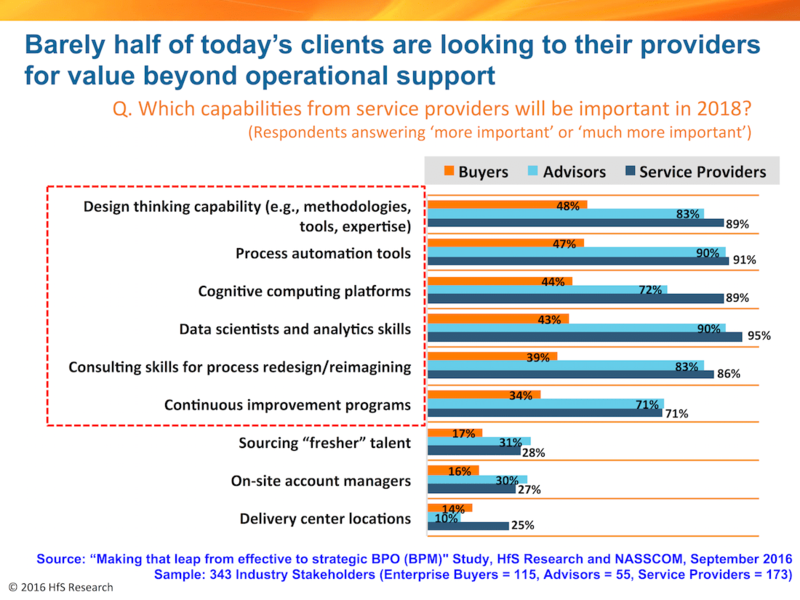 So you need partners who can help you pivot fast, and combat these potential fatal threats to your business model… and where better to look than BPO and IT services firms which can provide the scale, talent and analytics you need to operate with the flexibility you need, without the burdensome capital investments? When we look out into the future of the world leading companies, the Global 2000 in five years time will look very different to what it does today. As we’ve discussed many times before, enterprises are looking to focus on their core and stop adding size and scale to grow. With businesses which interact with their customers, partners, suppliers and employers using apps and collaborative tools, the focus is quickly shifting to growing profitability through smart scalability of customer base, as opposed to linear revenue growth. This means a $100m digital business in the future could command $10-20m in outsourcing spend a year to drive its business forward. But the crux of the problem today us today’s outsourcing providers are still obsessing around pursuing $5bn+companies because they only see their success in going through the initial labor arbitrage, as opposed to pursuing clients which to not have the legacy back office burden and just need agile services they can plug into quickly and effectively. Outsourcing providers need to completely revamp their account management models to cater for the evolving digital business – but this something well within their capabilities… just go hire forward-thinking sales leaders and build teams of people who can work with the emerging companies of the future, not just the ones of the past. In addition, providers need to ensure they have the ability to cobble together smaller delivery teams which can quickly grasp the needs of these evolving clients. Hence, they need large investments in training and Design Thinking to help with outcome and goal setting with clients. The old “master/slave” delivery model will be a thing of the past with the emerging digital business, which will demand much faster ramp-up times and staff who can quickly respond to their unique business needs. So it’s time to be smart, time to be prepared to help our clients combat, and ultimately win this war with digital disruption. BPO and IT services provide a critical foundation, so let’s prepare to reinforce to the world what we stand for and the sustained value we deliver every day to thousands of clients around the world. Source: horsesforsources.com-Let’s make Outsourcing Great Again! The move in recent years to find new ways of articulating the value that suppliers believe are the real benefits of outsourcing has included discussion about how the industry defines itself. It is my view that in the next few years, we will see a split – between those business partners that move inexorably towards the ‘vested’ model and those that remain committed to the long established ‘purchase and supply’ commodity model. The future of the sourcing industry will be debated at Sourcing Predictions 2017, a GSA event on the 15th of December at Linklaters, 1 Silk St, London. This is a great opportunity to learn more about the trends affecting the sourcing industry. GSA Sourcing Predictions 2017, click here.